I'll miss my late night phone conversations with Jim Moseley. Despite trying to track how he was doing in his fight against cancer I didn't hear the bad news until yesterday. Jim died on November 16, 2012. One of my regrets that I never had the opportunity to visit him in Key West and spend a day with him. Even though we never met in person, he was a friend. 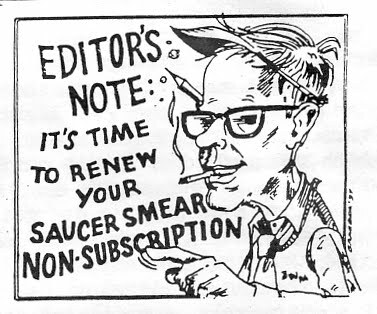 I mainly knew Jim as a voice on the phone -- and, of course, as the writer-editor of the zine Saucer Smear (and also as the author of postcards he sent to me marked PRIVATE AND CONFIDENTIAL). Jim was around at the dawn of ufology -- or as the topic was called way back then, flying saucers. Parts of the field he couldn't accept, personalities way out there without anything real to back them up. For example, George Adamski. Jim was critical of "ufoology." Through his writings Jim made friends and enemies. His humor and tell-it-like-it-is attitude didn't endear him to everyone. He said that one anti-UFO skeptic was probably gay. The skeptic threatened legal action through his lawyer. Jim backed off. Then the skeptic came out of the closet. Jim was right. Gray Barker, one of Jim's friends who had died years ago, was gay. Jim was open-minded; he didn't care if the skeptic was gay but that the skeptic -- someone revealing "the truth" about others to the ignorant masses -- wasn't being truthful about himself. When I asked him about what the title of his zine meant, Jim told me he wanted to smear the lies. Sometimes he would call and my answering machine would pick up. He left messages like "Dr. X, this is Mr. Y." Jim was 81 years old but when talking with him on the phone he had the irreverence, spirit and energy of an 18 year old. Until the last call. I hadn't heard from him in a while and caught him at home. He sounded tired, weak. He said he would have to go to the hospital because he wasn't eating. You could tell the cure -- radiation and chemo -- were doing a number on him. The last words he said to me before hanging up: "You're a good man, Ray." Jim Moseley was a good man.